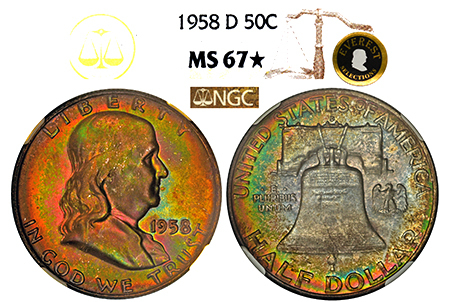 Just one of three examples in the HIGHEST grade in Mint State, non-FBL grade for the 1958-D! A very tough coin to find in clean, high-grade condition. With only 21 graded in MS 67, this example exhibits excellent condition coupled with toned eye-appeal. The obverse is doused in swirling jeweled hues of emerald green and magenta, with touches of neon orange, fiery red, and amethyst! It’s stunning to see vibrant and lustrous colors pop off the surfaces when viewed from different angles! The reverse has a pewter toned center with a bright pop of deep emerald green, neon green, and sunburst orange explode along the rim! A phenomenal 1958-D well deserving of the coveted Everest title!